Over the last few months, a Zimbabwean leader has allowed his people to violently harassed rival supporters, used undemocratic means to expel party members who dared to disagree with him, walks around with an aggressive militia and rejects any dissent. If these words were written before November, every Zimbabwean would recognise the leader as Robert Mugabe. Fast forward a few months and Mugabe appears to have an heir to his violent, aggressive and undemocratic throne and astonishingly it is the new MDC leader Nelson Chamisa. Even his own Vice President, Elias Mudzuri, couldn't find anything nice to say about Chamisa, castigated the ejection of Thokozani Khupe from the party, and has expressed doubt over his ability to rule. 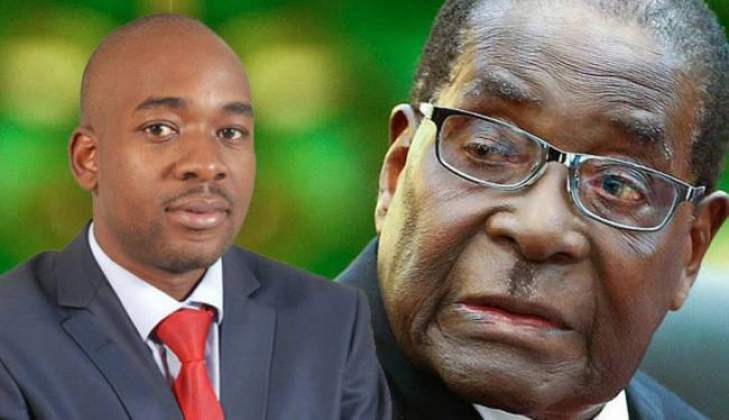 However, Chamisa's transformation into a "Mini Mugabe" is his reaching out to Zanu-PF rejects in the form of the expelled G40 cabal to bolster his chances at the ballot in July. Chamisa was recently captured posing for a picture with the Zanu-PF expelled trio of Shadreck Mashayamombe, Kudakwashe Bhasikiti and Jeppy Jaboon in a thread that went viral on social media. Jaboon admitted "Chamisa is my colleague," while claiming their mutual objective as opposition political parties was to remove Zanu-PF from power. So, finally, the cat is out of the bag. Chamisa has no scruples and no ideology. He will side with his greatest enemies and people who stand in direct opposition to what the MDC has historically stood for if it means entering State House. That Chamisa would side with people like Jaboon, who is out on bail after violently assaulting a businessman who uploaded a video with displeased him, and was a prominent member of the Zanu PF and G40 until recently, tells you everything about the man's moral compass. After more than three decades of suffocation, the MDC must offer something different. We need a leader who sees their country and the people first, and personal aspirations a distant second. Chamisa must be stopped, first for the sake of the real MDC, the party that fought for freedom, and secondly, for the country. The transformation of Chamisa into Mugabe is almost complete, so we don't have much more time to make the necessary changes before the soul of our party is ripped out and sold to the most aggressive bidder.